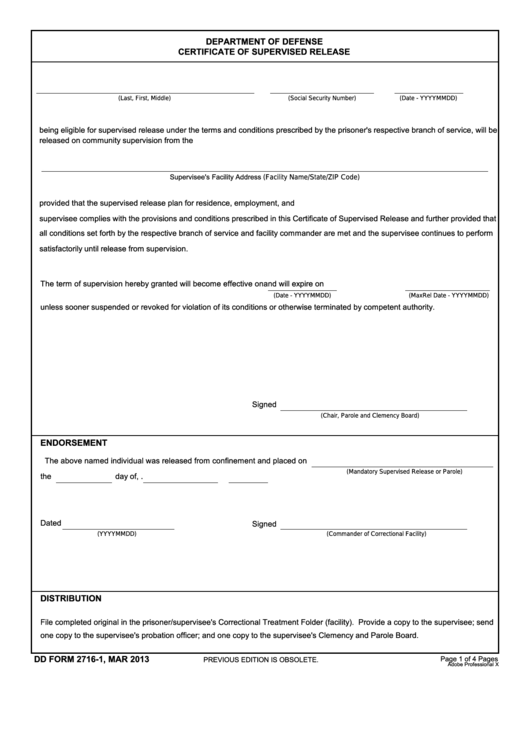 Download a blank fillable Dd Form 2716-1 - Dod Certificate Of Supervised Release in PDF format just by clicking the "DOWNLOAD PDF" button. Complete Dd Form 2716-1 - Dod Certificate Of Supervised Release with your personal data - all interactive fields are highlighted in places where you should type, access drop-down lists or select multiple-choice options. satisfactorily until release from supervision. unless sooner suspended or revoked for violation of its conditions or otherwise terminated by competent authority. one copy to the supervisee's probation officer; and one copy to the supervisee's Clemency and Parole Board.